Make sure your Samsung Galaxy S8 is always fully charged and synced with this compatible USB 3.1 Type-C Male To USB 3.0 Male Cable. You can use this cable with a USB wall charger or through your desktop or laptop. I needed a replacement charging cable for my Samsung Galaxy 8. This cable is great and also thick, unlike the one you get with your phone. Heavy duty version of standard Samsung cable. Excellent product. This Samsung Galaxy S8 compatible cable is designed to connect your phone and other Type-C equipped hardware to USB powered equipment so you can sync and charge your device. This quality cable allows you to connect your Samsung Galaxy S8 to your laptop or desktop, in order to charge your phone and exchange / sync data simultaneously. 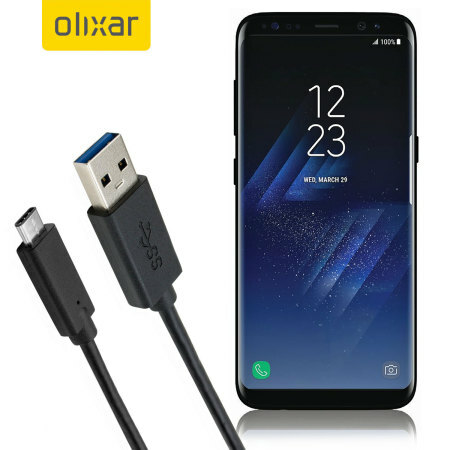 With a standard USB connection this cable is compatible with a mains charger featuring a USB input, as well as a laptop or PC - so you have complete flexibility for your Samsung Galaxy S8 charging needs.